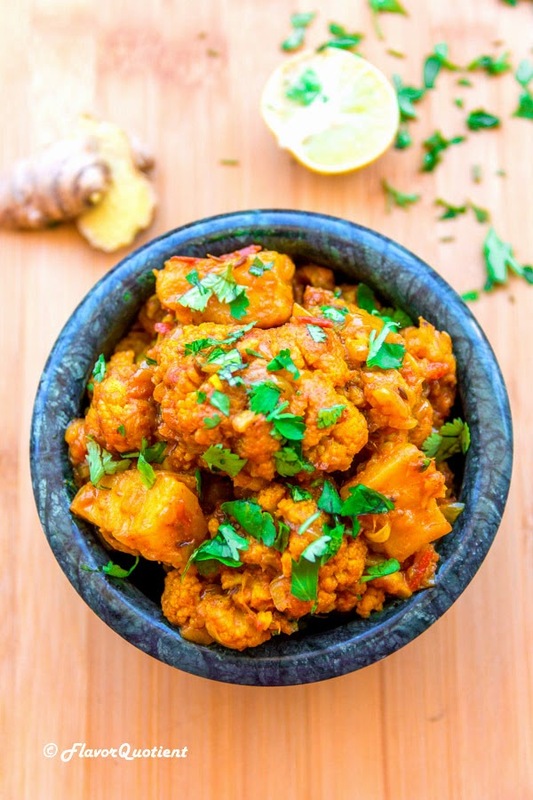 Presenting a humble yet popular Indian curry, aloo gobi, with all quintessential flavors of Indian cuisine! I am playing little safe these days! Let me rant a little before I go into the aloo gobi recipe! These days I am sharing the very regular recipes of my family – like that aloo-peyajkoli bhaja (a.k.a. Potato and green onion stir-fry) which I shared recently. These are recipes we are brought up on and are so integral part of our meals that I took them for granted and believed that they are not worth sharing! But I was so utterly wrong! Regular homely recipes seem to be insignificant but they are real gems of our cuisines! Otherwise how could have we possibly eaten the same dish again and again! 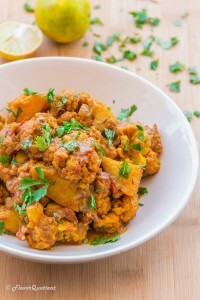 Like this aloo gobi for example. 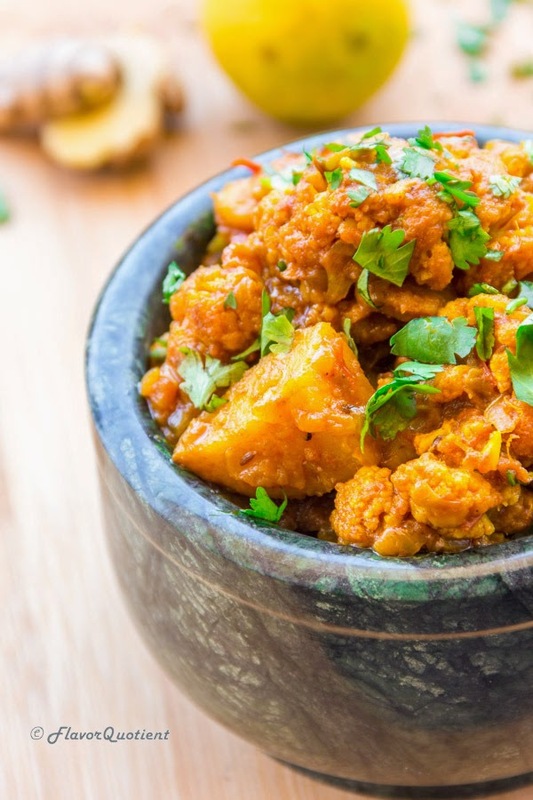 I don’t have any clue how many times I have had this aloo gobi curry in my whole life and I am sure I will have more and that’s the beauty of it! These recipes are timeless! Coming to aloo gobi sabzi, this may be the one recipe which I can make blindly every time; but I would be more than happy if someone thousands of miles away from me tries this recipe and have a smile on their face! Like I try your family recipes, you should try mine! 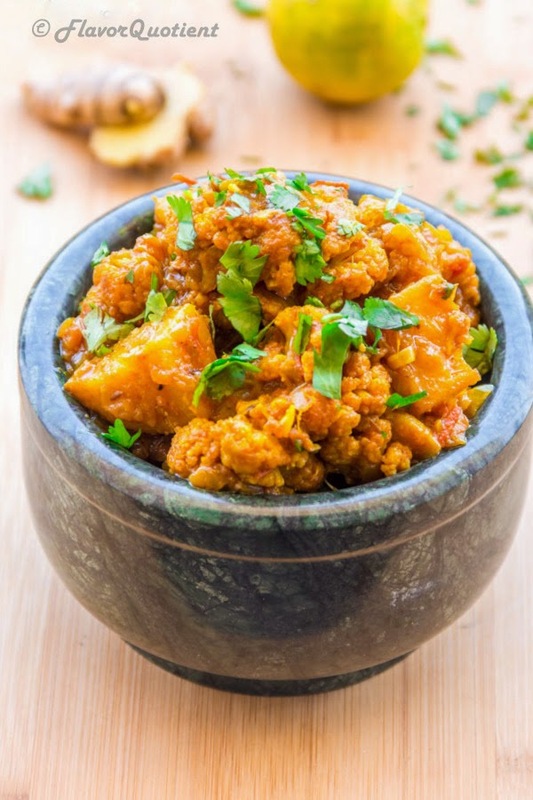 This aloo gobi, which can be decoded as potato-cauliflower curry is one of the flagship recipes of Indian kitchens. Potato & cauliflower – these two vegetables make a perfect combination as they both are experts in soaking up flavors from the spices you cook them in. I enjoy aloo gobi most with plain rice; but my better half is more inclined towards the breads – rotis or parathas. I would safely say that this goes well with either of the two – rice or bread. You can also experiment to combine this similar curry sauce with other veggie combinations and I am sure it won’t spoil anything. This onion-tomato based curry is quite versatile and robust which makes the base for most of the Indian curries. But if you would also like to play safe like me then don’t think twice and just straight away make this awesomeness a.k.a aloo gobi! Heat oil in a skillet/wok and add cumin seeds. Let them crackle. Keep the flame on medium-low; else the cumin seeds will burn. When the oil is fragrant, add the ginger-garlic-chilli paste and sauté for a minute. Now add the chopped onion and fry them till they turn golden brown in color. When the onions have softened and become brown, add the chopped tomatoes. Mix well. Sprinkle the sugar to balance the acidity of the tomatoes. Cook the tomatoes till they are totally soft and mushy. In a small bowl, make a smooth paste of the powdered spices – turmeric, coriander, cumin, red chilli and garam masala – using a little water. Add this spice paste to the wok and saute on medium-high heat till oil starts separating from them. Add half of the coriander leaves, raw mango powder (amchur) and salt to taste. Mix well. Now add fried potato cubes and cauliflower florets and mix with light hands (so that the cauliflower florets do not break) to coat them with the spices. Add half a cup of water and bring it boil. Then cover and simmer it for 5 to 10 minutes or until the vegetables are fully cooked. Boil off some water if the gravy is too thin. Sprinkle the remaining coriander leaves and serve hot with plain white rice or roti. Residence 604 Interactive Home & Food Magazine has selected your Pin to be featured alongside Life of Pi, for an upcoming edition of Pintastic Movie & Meal Match-up.